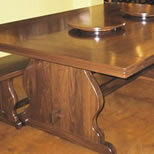 These Texas furniture makers create custom furniture in traditional styles as well as "Western" furniture. Not everyone's a cowboy, you know. Several of these furniture designers have won awards for design, we're proud to say. Truly Texan only recommends the best furniture artisans in Texas. We don't accept just any old body and that's a fact.